Sweet and refreshing with a whole lot of chewy goodness, since its creation in the 1980s in Taiwan bubble tea has gained global popularity with many bubble tea stores popping up in many countries, including in Indonesia. 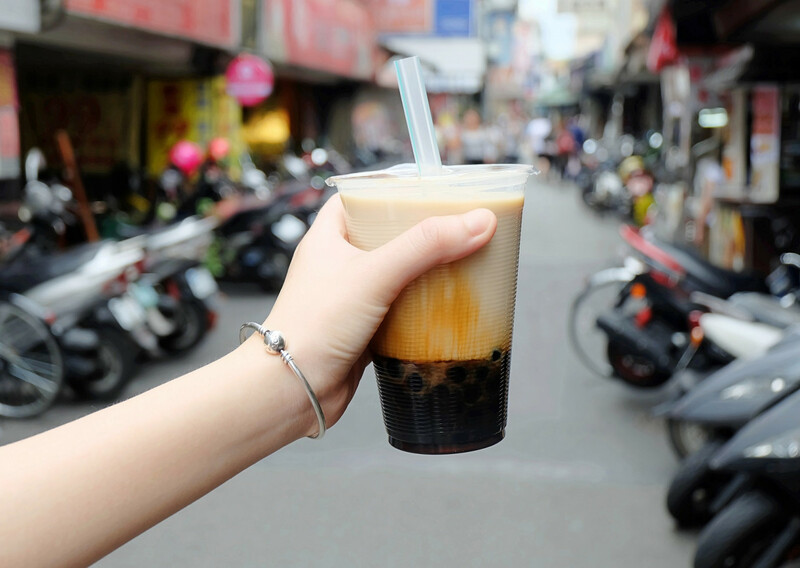 So when you have the chance to hit the streets of Taiwan’s capital of Taipei, make sure you slurp up the tasty combinations of tea and chewy tapioca pearls offered by these famed bubble tea stores. 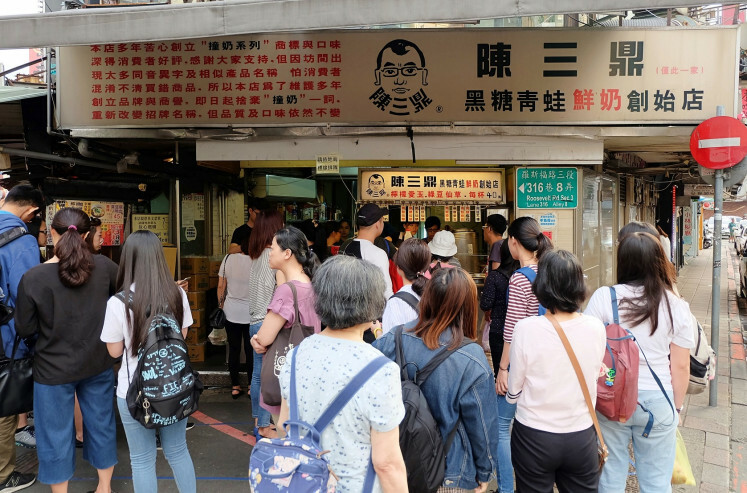 Believed to be the birthplace of pearl milk tea, Chun Shui Tang started its journey as a small teahouse in Taichung, a city in central Taiwan, which was established by Liu Han-chieh in 1983. One day in 1987, Lin Hsiu-hui, the product manager at Chun Shui Tang, mixed her fen yuan (tapioca pearls) dessert into her iced tea drink during a meeting. Everyone in the meeting loved the beverage, and the rest is history. Chun Shui Tang now has more than 40 stores in Taiwan and has branched out to Japan. You can find one of the Chun Shui Tang stores at Shin Kong Mitsukoshi department store in Taipei’s upscale Xinyi district. The store serves various pure and flavored tea drinks, aside from its specialty of pearl milk tea. A medium iced pearl milk tea of around 660 milliliters is priced at NT$160 (US$5), while a small cup costs NT$85. The pearl milk tea resembles a milkshake with a light texture and small black tapioca pearls at the bottom of the cup. The drink boasts strong tea and milk flavors. Chun Shui Tang allows customers to customize their sugar and ice level. If you’re looking for a fresh, fruity drink, look no further than Degugu, located near Taipei Metro’s Zhongshan Junior High School station. Degugu is best known for blending fruit juice into its bubble tea drinks. Their popular beverages include Berries Black Tea (a 591 ml cup costs NT$85), Degu Fruit Tea and Grapefruit Black Tea with Honey. These drinks don’t come with pearls, but you can add a white tapioca pearls topping for NT$10. “Taiwanese people like tea added with fruits, it’s fresher and cooler,” said Bread Liao, who founded Degugu with her husband Allen Wang. “Our store uses Taiwan’s fresh fruits [and] Taiwan’s tea leaves,” she added. Its green tea, red oolong tea and gaoshan (high-mountain) tea are all sourced from Taiwan. Its black tea comes from Taiwan and Sri Lanka, while its honey comes from Taiwan’s Yunlin county. Degugu offers a customized sugar level, yet it recommends a half serving of sugar for the best taste. 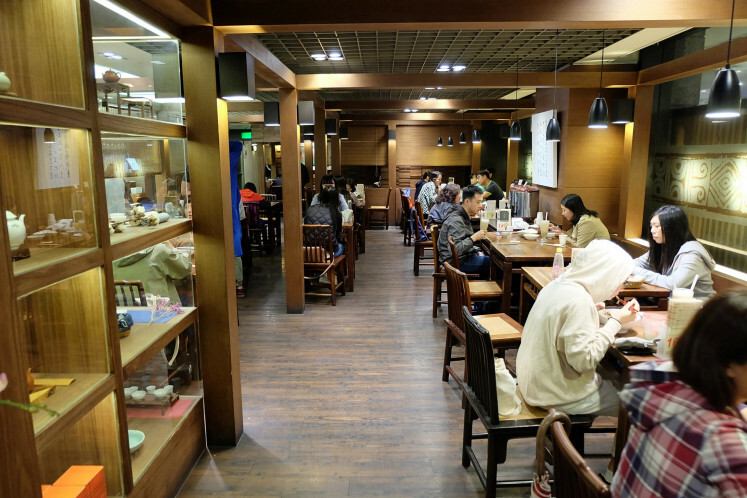 Located near the National Taiwan University, Chen San Ding prides itself on its distinct bubble drink creation qing wa zhuang nai, a cup of creamy milk with brown sugar and tapioca pearls that resembles frog eggs. Chen San Ding’s sole store is just a few hundred meters away from Taipei Metro’s Gongguan station. The lines there are unavoidable, but they move fast. The store works at high speed to prepare the drinks. With the price of NT$40 per cup, the drink consists of cold milk and warm pearls that boasts a soft and less starchy texture. “It [bubble tea] is the sweetest one here [in Taipei],” said Nataliia Sharypova, a Russian student who is pursuing a master’s degree in Taipei. Unlike many bubble drink shops in the city, Chen San Ding doesn’t have a customized sugar level chart for its drink, but it offers an option to make one’s drink with less or no ice. Aside from its famed beverage, the shop also offers a wide array of drinks with toppings of grass jelly, mung beans and aiyu (jelly fig seed). 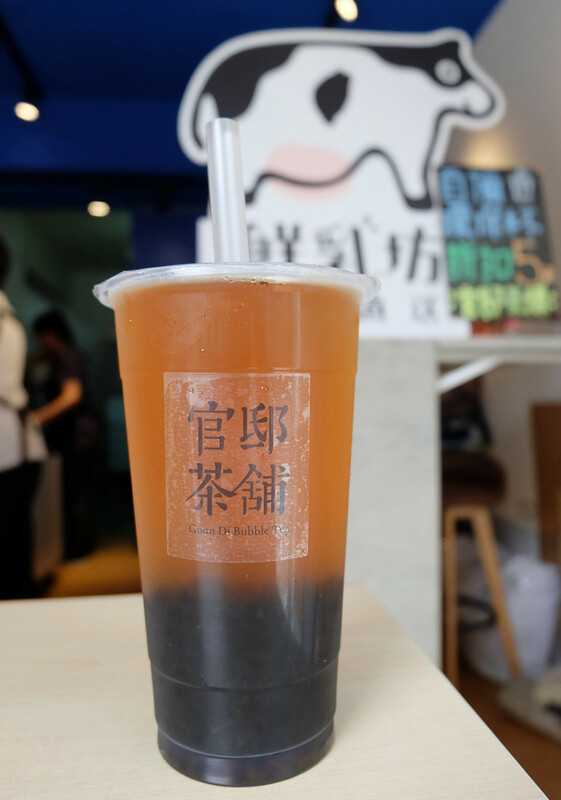 Guan Di Bubble Tea’s oolong tea is so famous that customers from the northern part of Taiwan are willing to go all the way to its only store located near Taipei Metro’s Shilin station. A cup of its famed oolong tea drink – gao shan si ji chun (Alpine four seasons tea) – costs NT$30. You can have additional tapioca pearls topping for NT$5. As no milk is added to it, the bubble tea boasts a strong oolong aroma and taste. You can find the creamy and sweet taste of taro in many Taiwanese desserts and also in bubble tea. 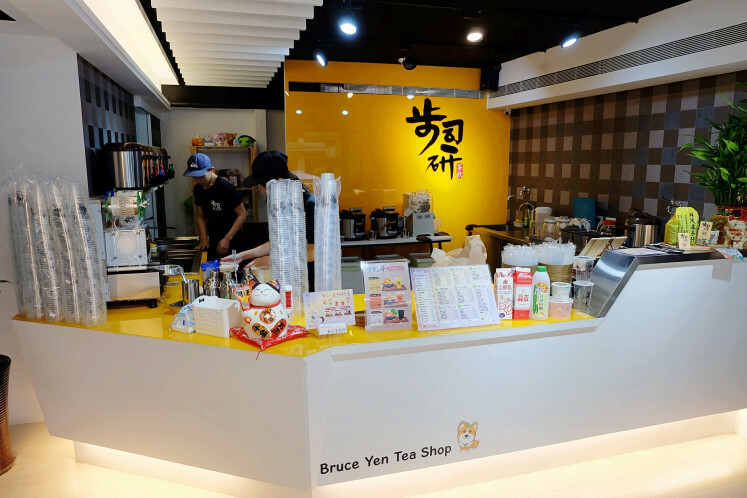 Bruce Yen Tea Shop, a short walk from Taipei Metro’s Nanjing Fuxing station, offers a cup of black tea latte with taro smoothie and sweet golden tapioca pearls. It costs NT$95 for a large cup. When ordering, remember to ask for hong cha na tie (black tea latte) with extra yu tou (taro). Purwati, an Indonesian caretaker, says that Coco’s zhen zhu nai cha (pearl milk tea) is her favorite. Coco opened its first store in 1997 and now operates numerous branches in Indonesia. “The taste hits the spot. Delicious. The bubbles are chewy,” Purwati said. Febroza Belda, an Indonesian student in Taipei, considers 50 Lan’s bubble milk tea to be her favorite. ”At [50 Lan], we can choose big or small bubbles,” she said. 50 Lan stores can be easily found in many corners of Taipei.